Shanghai Waigaoqiao International Cruise Terminal or Haitong Pier (Chinese:外高桥海通码头) is part of Shanghai Port, located at Waigaoqiao in Pudong New Area, 30km from downtown Shanghai. 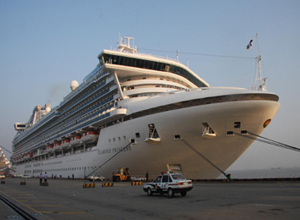 Ships larger than 87,000 tons will not get to the Shanghai Port International Cruise Terminal, due to the low bridge on Huangpu River, and will have to berth at the scenic and relaxing terminal in Waigaoqiao or Wusongkou terminal. Waigaoqiao can handle four cruise ships at the same time.